The most important week in the life of the Church is Holy Week – the final week of Lent, which begins with Palm Sunday and culminates in the Holy Triduum – the three holy days of Maundy Thursday, Good Friday, and Easter. During these days, the story of salvation is celebrated as we remember the Passion, death, and resurrection of Christ. Our celebration of Holy Week is more than an historical reenactment of Jesus’ last days. It causes us to remember the love of God for us as shown through the life and work of Jesus. During this week, the Gloria Patri (“Glory be to the Father…”) is omitted to reflect the solemnity of these days, and to prepare us for the upcoming joy of the Feast of Easter. The Divine Service on Palm Sunday begins with the procession with palms, recalling Jesus’ entry into Jerusalem with the crowds praising “Blessed is He who comes in the name of the Lord! Hosanna in the highest!” The entry into Jerusalem is read during the Processional (St. Matthew 21.1-9). The Holy Gospel for the Divine Service is the Passion according to St. Matthew (St. Matthew 26-27), a seemingly contrasting story. Yet it reminds us that our true victor King is Jesus Christ crucified. The victory and death that we praise Him for is His death on the cross and resurrection from the grave. Observances of celebrating with palms go back to fourth-century observances in Jerusalem. Palms are symbols of hope, life, and victory. A common custom is to use the palms to make ashes for the following year’s imposition of ashes on Ash Wednesday. Worship on these days of Holy Week centers on the reading of the Passions according to St. Mark (14-15) on Tuesday and St. Luke (22-24) on Wednesday. The word “Maundy” is from the Latin mandatum, from the phrase “a new commandment” of St. John 13.34, a portion of the Holy Gospel for this day. Since the fifth century, the institution of the Lord’s Supper has been commemorated on this day. Christ began this meal with His disciples in the upper room as a means to be with His Church after His Ascension. Every Sunday and festival, God’s people continue to partake of the body and blood of Christ in the Sacrament. Because of this wonderful means that Christ instituted for our forgiveness and strengthening of faith, the Maundy Thursday Divine Service is more festive than the rest of Lent. The Gloria in Excelsis is sung in Lent only on this day. The somber mood returns at the end of the Divine Service, as the Stripping of the Altar takes place in preparation for Good Friday. All of the sacramental vessels, candles, the missal stand, and the paraments are removed from the altar. Other items are removed from the sanctuary and chancel area to prepare for the solemn worship of Good Friday. While the Stripping of the Altar takes place, Psalm 22 is sung. The congregation leaves in silence. The Hymn of the Day for Maundy Thursday is Jesus Christ, Our Blessed Savior (627). This hymn of Martin Luther is an expansion and translation of a fifteenth-century hymn of John Hus, a forerunner of the Reformation. Additional hymns on the Sacrament of the Altar are also appropriate. “O sorrow dread, God’s Son is dead!” The high point of Holy Week is Good Friday. On this day, we celebrate the atonement (payment for sin) won for us by Jesus Christ as He was offered up for us as the sacrificial Lamb of God. Although we mourn our sins and the suffering and death of God’s Son, this day is ultimately about the Gospel. While it is somber, it is still Good Friday. It is good because it shows the great love of the Triune God for us. It is good because we are certain of the victory He has won for us. The celebration of Good Friday dates back to the fourth century. Various traditions have included the veneration of the cross and hymns and liturgical responses about the Passion and Crucifixion narratives. The altar is covered in black paraments or stripped completely. Crucifixes are veiled. The liturgy and hymns are simple, sung with little or no organ accompaniment. 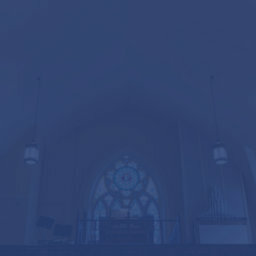 The people enter and leave in silence, with no organ service music. The Bidding Prayer is often prayed on this day. The Gospel at the Divine Service is the Passion of St. John (18-19). Through this Gospel, we hear that the suffering and death of Jesus has made full atonement for sins, and that Christ will be victorious over sin, death, and the devil. The Hymn of the Day is A Lamb Goes Uncomplaining Forth (438), by Lutheran hymnist Paul Gerhardt, which meditates on Christ’s atonement. Many other fine hymns are appropriate this day, such as O Sacred Head, Now Wounded (449), The Death of Jesus Christ, Our Lord (634), O Dearest Jesus, What Law Hast Thou Broken (439), and O Darkest Woe (448). 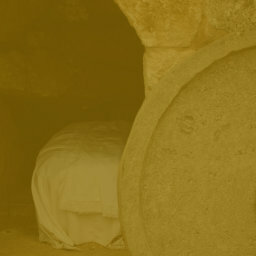 Holy Saturday focuses on Christ’s rest in the tomb and His descent into hell, a demonstration of His complete victory over death. After sunset on Holy Saturday, the Easter Vigil begins the celebration of Easter, in anticipation of the greatest feast of the year on the following day.